Take a sunshine bingo break at Costa Bingo, the smiley online bingo site with a beach holiday theme and a mascot called Sunny. The site has a blue and yellow colour scheme which reminds you instantly of clear blue skies and golden beaches and puts you in a good mood before the fun has even begun. 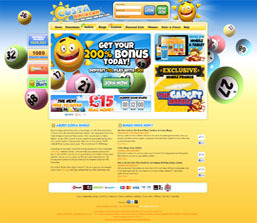 All the latest bingo news is displayed at the bottom of the home page and the side panel has the latest promotions. It’s easy to register – just click on the Join Now button in the centre of the screen, pick up your bonus and start playing! Read how it works in this Costa Bingo Review. Costa Bingo is the pioneer of free bingo, with free games playing 24 hours a day 7 days a week. The free games also have real cash prizes up for grabs. There is a great choice of bingo available, including 75 ball bingo, 90 ball bingo and 75 ball more winners bingo, in addition to progressive jackpot and guaranteed jackpot games. The guaranteed jackpot games at Costa play every day with £2,500 jackpots up for grabs and on Fridays the famous £10,000 jackpot game called Costa Crazy kicks off at 10pm – this sizzling game is free to enter. Other games shining brightly at Costa include a range of instant games and casino table games, as well as chat tourneys led by fun and friendly chat hosts and buzzing team games. Costa is also now also available on mobile and tablet so you can enjoy the sunshine wherever you are! New roomies at Costa Bingo can claim a 200% welcome bonus when they make their first deposits and get a free pass to the First Time Depositor Freebie game where there is £15 available to be won every hour. Regular players can enjoy a 50% re-deposit bonus on top of every reload and then gain access to the Daily Deposit Reload freebie, where there is a new £15 jackpot game playing every 30 minutes. There are always loads of fun promotions running every month with hot prizes, such as gadgets, holidays, vouchers, spa days, even cars. In addition to all the games and prizes Costa players are also members of the Diamond Club, a special loyalty scheme where you can earn Diamonds as you deposit and climb the players class levels – these Diamonds can be exchanged for lots of goodies in the Diamond Store such as free cards to games, bonus cash, real cash and more. Costa Bingo is owned by bgo Entertainment and is licensed by the government of Gibraltar. The site uses top encryption technology to ensure the absolute safety of your personal and financial information. It is easy to get in touch with Costa with any queries – just click on the Help button in the top menu to be taken to a page with all the contact details, a FAQ section and getting started guide. You can contact the friendly support team by e-mail, phone or live chat.